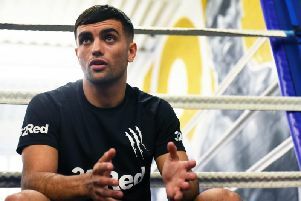 Being compared to one of Britain’s best ever boxers is just the latest accolade that Jack Catterall can add to his ever-growing CV. His promoter Frank Warren dubbed the 21-year-old southpaw from Chorley the next Ricky Hatton after his latest stand-out victory over Olympian Tom Stalker. Catterall, who was the outsider according to the bookmakers but not to the boxing world, dominated Stalker and stopped him in the eighth round. He said: “It was great to be compared to somebody like Ricky Hatton. “Obviously, he’s a former world champion and he sold out arenas everywhere he boxed. “But I want to be known for being my own person. After signing with Warren and Queensberry Promotions, he took to the ring on May 10, where he defeated the durable Krzysztof Szot over eight rounds. Two months later, Catterall was back in the ring once again as he made light work of Nathan Brough, knocking the Liverpudlian out in just two rounds and for his efforts he was crowned the Central-Area light-welterweight champion. Then in October, he defeated Stalker to be crowned the WBO European champion. Catterall feels the recent fights have certainly boosted his career. “I preferred the Brough fight, although I stopped him early,” said Catterall. “I thought he was the harder fight, it was my first 10 rounder, he was much taller, he had a longer reach and Lee Beard, my coach, wasn’t in the corner. “It was a big step up and I rose to it. “I enjoyed the Stalker fight too, as he was very hot-headed but it made me want to win more, and the fight boosted my profile. Catterall is already relishing returning to the ring in 2015 after the WBO ranked him 13th in world in the light-welterweight category. Although a new fight hasn’t been confirmed, he has resumed light training. He said: “A few weeks ago I spent three weeks in Dublin sparring Steve Ormond before his fight with Terry Flanagan, but in the end the fight didn’t go ahead as Steve fell ill.
“It was a good experience for me. “Nothing has been confirmed yet for when I get back into the ring, but we are looking at the end of February. Now I’ve been ranked by the WBO, we can start looking at serious opponents, hopefully we can announce something soon. “I would love to get four or five fights under my belt and my aim is to finish 2015 undefeated and hopefully get another couple of titles. Warren certainly has major plans for Catterall. He said: “I’ve always been impressed with Jack, from his one-punch stoppage of Nathan Brough and then digging-in to stop Tom Stalker with a badly swollen eye. “He’s got a great skills set and he’s only 21 so there’s plenty of time to continue learning and developing under the watchful eye of Lee Beard. “Next year will be a big year for Jack. I think he’ll breakthrough into the mainstream and I’d like to see him have the British title this time next year. “He can fight, he’s a good-looking kid and he’s got a strong fan base so I see him going from strength-to-strength.